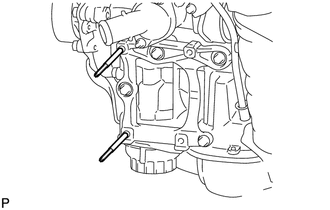 (a) When replacing the cooler compressor assembly with a new one, gradually discharge the inert gas (helium) from the service valve, and drain the following amount of oil from the vents indicated by the arrows in the illustration before installation. The drain bolt and washer can be reused. If a new compressor is installed without removing some oil remaining in the pipes of the vehicle, the oil amount will be excessive. This prevents heat exchange in the refrigerant cycle and causes refrigeration system failure. If the volume of oil remaining in the removed compressor is too small, check for oil leaks. Be sure to use ND-OIL 8 or equivalent for compressor oil. (a) Using an E8 "TORX" socket wrench, install the 2 stud bolts. (b) Install the the 2 bolts and 2 nuts to the compressor assembly with pulley. 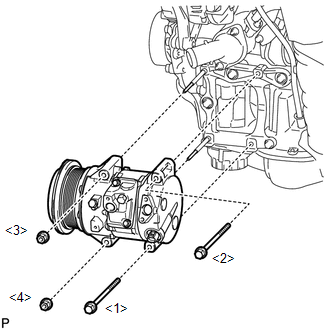 Tighten the bolts and nuts in the order shown in the illustration to install the compressor assembly with pulley. (a) Remove the attached vinyl tape from the hose. 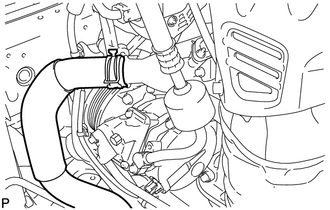 (b) Apply sufficient compressor oil to a new O-ring and the fitting surface of the compressor assembly with pulley. (c) Install the O-ring onto the suction hose sub-assembly. Keep the O-ring and O-ring fitting surfaces free from dirt or any foreign objects. 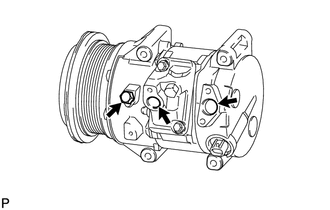 (d) Install the suction hose sub-assembly onto the compressor assembly with pulley with the bolt. 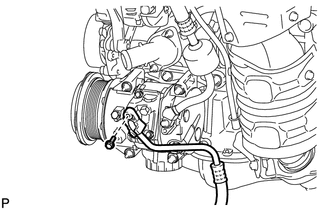 (c) Install the O-ring onto the discharge hose. 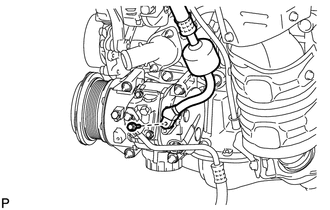 (d) Install the cooler refrigerant discharge hose onto the compressor assembly with pulley with the bolt. (e) Using pliers, grip the claws of the clip and slide the clip to install the No. 2 radiator hose. 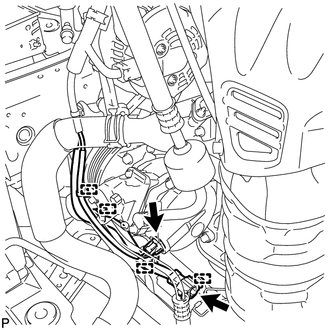 Refer to the procedure for Install Radiator Assembly (See page ). When disconnecting the cable, some systems need to be initialized after the cable is reconnected (See page ).